Many museums, new and old, continue to retain classic architectural elements of marble floors and masonry finishes, high ceilings, and large atriums. While visually charming, these elements can lead to noisy exhibition halls and atmospheres not conducive to quality exhibit environments. Excessive reverberation and echo combined with poor speech intelligibility and background noise can detract from the potential impact of the exhibit. Our goal is to localize, isolate, and diffuse exhibit sound to improve the acoustical environment of your museum or exhibit hall. Acoustic Panels can help absorb the extra noise from music, narratives, interactive displays and ambient noise commonly found in museums. We offer a wide range of sizes, materials, and shapes to meet the unique concerns of museum aesthetics. For example, our team can create Custom Size Acoustic Panels to meet your specifications of size, shapes, and fabrics. Alternatively, Art Acoustic Panels allow you to incorporate digital print on acoustic panel substrate throughout the exhibit. Acoustic Baffles are mounted on ceiling hardware and can be almost unnoticeable within the environment. Acoustic applications are not limited to exhibits and displays. Consider adding sound treatments in public areas and gathering spaces. 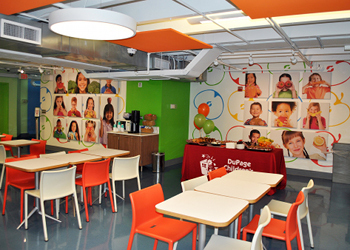 The Dupage Children's Museum used Art Acoustic Panels in their children's cafe to help add both sound and visual improvements to the area. We had the opening of the S.M.A.R.T. Cafe at the DuPage Children’s Museum yesterday. I just wanted to send a picture of the printed acoustic tiles so that you could see them in place.